Photo for the Mirror by Chuck Meyers Penn Cambria’s Lyric Janosik leaps to a first-place finish in the long jump, tying a meet record. Lyric Janosik was a pre-schooler when Rachel Gehret was dominating the area girls track and field scene. Gehret graduated from Altoona Area High School in 2006 with one PIAA Class 3A gold medal, four silver and two bronze in jumping events. 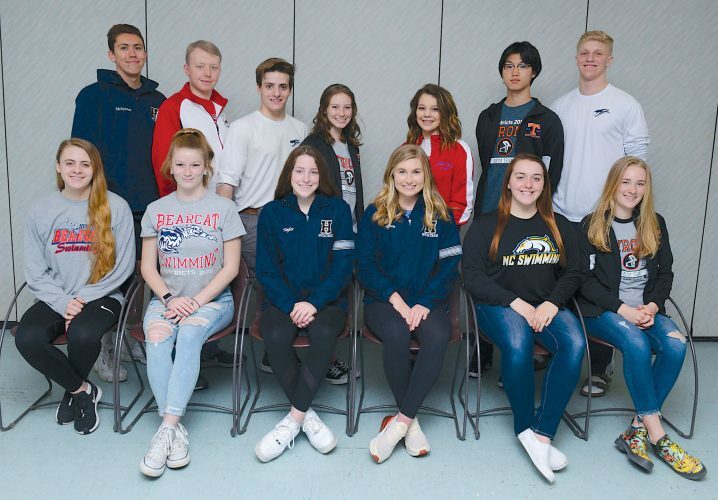 Janosik, now a Penn Cambria High School junior, might be from nearly a different generation than Gehret, but she notched her name next to hers in at least one category on Saturday. 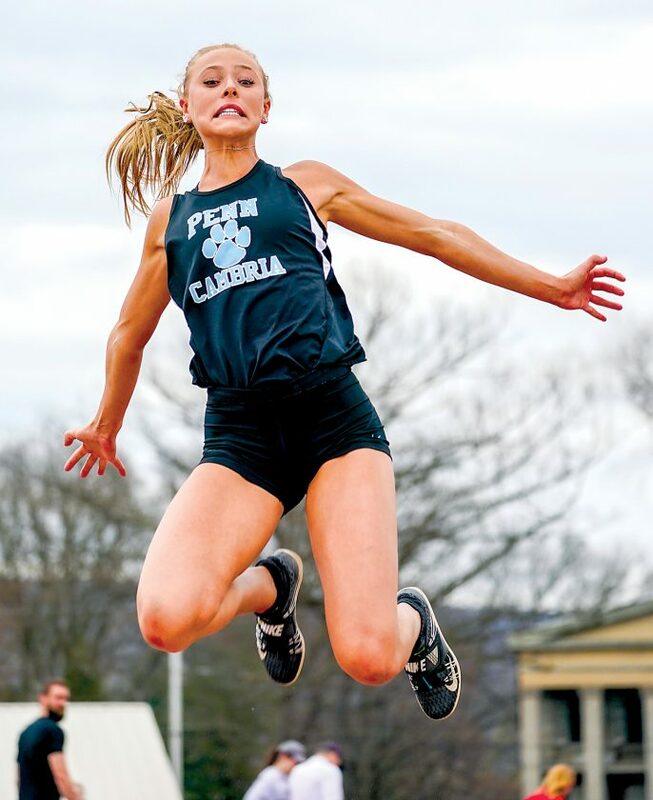 Janosik tied Gehret’s 13-year-old Altoona Igloo Invitational record in the long jump with a leap of 18 feet, 9.5 inches to highlight the girls action at Mansion Park. Janosik won by 1 foot, 5 inches over second-place Darcie Frazier of Hollidaysburg. Only two other long jumpers bettered 16 feet in the 20-team invitational that typically signals the start of the area track and field season. Janosik, who stands 5-foot-10, qualified for states last year in both the long jump and triple jump and brought home a seventh-place medal in the Class 2A long jump. She finished third in both the 100-meter dash and high jump on Saturday but didn’t compete in the triple jump. While Janosik has some experience to help her continue to shine at big meets, Hollidaysburg Area freshman Joelle DeLattre is just getting her feet wet, and she got started in the right direction in her first-ever invitational. DeLattre, also at 5-10, raced to a first-place finish in the 400 dash by improving four places from her fifth-place seeded time. DeLattre finished in 1 minute, 3.44 seconds to edge top-seeded Avry Gumblatt of Clearfield by less than 1 second. DeLattre, who said volleyball is her favorite sport, knocked nearly 2 seconds off her previous best time. This is her first year running the 400, and she said she loves the event. No other girls from the Mirror coverage area won individual events, but Altoona picked up two first places in relays. The 400-meter relay team of freshmen Brooke Long and Ashtyn Hileman, junior Ta’Shay Seward and sophomore Darrian Berkheimer prevailed in 50.98 seconds, and the 1600 relay team of Berkheimer, Long and Hileman, joined by sophomore Sarah Graham, won in 4:17.70. Altoona also had five other top three finishes. Bradford’s Regan Johnson won both the 100 and 200 dashes, and Somerset’s Haley Stickle won both hurdles races. No team scoring was kept. 200 dash: 1, Johnson, BR, 26.67; 2, Frazier, HB, 27.14; 3, Stickle, SA, 27.98; 4, Sorg, EC, 28.01; 5, Seward, AA, 28.28; 6, Poleski, KA, 28.65; 7, Bartley, CN, 28.80; 8, Daum, FL, 28.81. 400 dash: 1, DeLattre, HB, 1:03.44; 2, Gumblatt, CL, 1:03.88; 3, Kear, EC, 1:04.46; 4, Daum, FL, 1:04.69; 5, Bartley, CN, 1:04.86; 6, Burk, HB, 1:04.96; 7, Nearhoof, FL, 1:05.79; 8, Fairman, KA, 1:05.83. 800 run: 1, Sullivan, KA, 2:26.45; 2, Bosworth, BR, 2:28.53; 3, LaBorde, CL, 2:36.99; 4, Peterson, KA, 2:37.29; 5, Koza, KA, 2:38.30; 6, Lewis, TY, 2:40.01; 7, Cunningham, BEA, 2:41.29; 8, Papay, FL, 2:42.22. 1600 run: 1, Shreffler, KA, 5:36.36; 2, McClain, HB, 5:43.35; 3, LaBorde, CL, 5:43.69; 4, Feltmeyer, FL, 5;44.78; 5, Peterson, KA, 5:46.95; 6, Lary, BR, 5:50.17; 7, Lewis, TY, 6:01.13; 8, Plazio, KA, 6:02.74. 3200 run: 1, Feltmeyer, FL, 12:55.26; 2, Kelley, AJV, 13:06.20; 3, Beer, PL, 13:17.13; 4, McClain, HB, 13:22.68; 5, Crissman, BR, 13:33.72; 6, Bartlett, BA, 13;41.40; 7, Sesmas, KA, 13:44.53; 8, Marasco, AA, 13:50.73. 300 hurdles: 1, Stickle, SA, 47.12; 2, Cutright, DL, 48.32; 3, Snyder, HB, 49.61; 4, Rentz, AJV, 49.95; 5, Galo, KA, 50.08; 6, Ferguson, BD, 50.45; 7, Giovanelli, KA, 50.48; 8, Veneziano, BEA, 50.99. 400 relay: 1, Altoona (Long, Hileman, Seward, Berkheimer), 50.98; 2, Hollidaysburg, 52.61; 3, Bradford, 52.66; 4, Somerset, 53.57; 5, Huntingdon, 53.68; 6, Elk County Catholic, 54.62; 7, Fort Leboeuf, 54.78; 8, Tyrone, 54.97. 1600 relay: 1, Altoona (Berkheimer, Graham, Long, Hileman), 4:17.70; 2, Bradford, 4:21.84; 3, Hollidaysburg, 4:23.73; 4, Kiski Area, 4:25.01; 5, Clearfield, 4:31.02; 6, Altoona B, 4:34.43; 7, Bald Eagle Area, 4:36.89; 8, Kane, 4:39.29. 3200 relay: 1, Bradford, 10:30.23; 2, Purchase Line, 11:14.18; 3, Bedford, 11:35.40; 4, Elk County Catholic, 12:03.02; 5, Bellwood-Antis, 12:04.85; 6, Hollidaysburg, 12:41.79; 7, Somerset, 12:59.13. High jump: 1, Newton, EC, 5-2; 2, Gwinn, HD, 5-0; 3, Janosik, PC, 5-0; 4, Brunner, BG, 5-0; 5, Jodon, HB, 4-10; 6, Clouser, AJV, 4-10; 7, Marconi, KA, 5-0; 8, Wienczkowski, FL, 4-10. Long jump: 1, Janosik, PC, 18-9.5; 2, Frazier, HB, 17-4.5; 3, Kear, EC, 16-8.75; 4, Johnson, BR, 16-0.5; 5, Krause, FV, 15-6; 6, Syster, PL, 15-6; 7, Newton, EC, 15-5.25; 8, Eaton, FV, 15-2.5. Triple jump: 1, Krause, FV, 34-10; 2, Long, AA, 33-10.5; 3, Brunner, BG, 33-7; 4, Parnell, HB, 33-1.5; 5, Caputo, AA, 32-11; 6, Miller, HB, 32-4.5; 7, Tryninewski, HB, 32-3; 8, Smith, SA, 32-2.5. Shot put: 1, Fike, SA, 36-5; 2, Holler, BEA, 34-5; 3, Starr, KA, 33-2; 4, Kenzevich, KA, 32-1; 5, Whysong, AA, 31-9.5; 6, Spence, DL, 31-4; 7, Buhl, KA, 30-0; 8, Luke, BR, 29-5.5. Discus: 1, Starr, KA, 115-7; 2, Spence, DL, 108-4; Hepler, KA, 100-2; 4, Fike, SA, 92-3; 5, Kiser, AJV, 89-8; 6, Price, AA, 84-8; 7, Engle, BA, 81-3; 8, Hillman, KA, 80-8. Javelin: 1, Ward, PL, 111-7; 2, Friedman, FL, 109-1; 3, Alwine, AA, 107-3; 4, Holler, BEA, 105-8; 5, Starr, KA, 105-0; 6, Beer, PL, 104-6; 7, Hillman, KA, 101-3; 8, Pompa, BR, 90-6. Pole vault: 1, Camacho, SA, 9-6; 2, Isenberg, HB, 9-0; 3, Kelley, AJV, 8-6; 4, Krier, AA, 8-6; 5, Hartman, BD, 8-6; 6, (tie), Shuke, BA; Wilt, HB, and McKinney, HD, 8-0.